What is integrating theory and content? I’ve had an opportunity to integrate theory and content learning by developing and completing a comprehensive communication project in my Master of Arts in Communications program at Queens University of Charlotte. In my final comprehensive communications project I was able to integrate theory and content learning. The best way to integrate theory with content is through completing a comprehensive literature review. 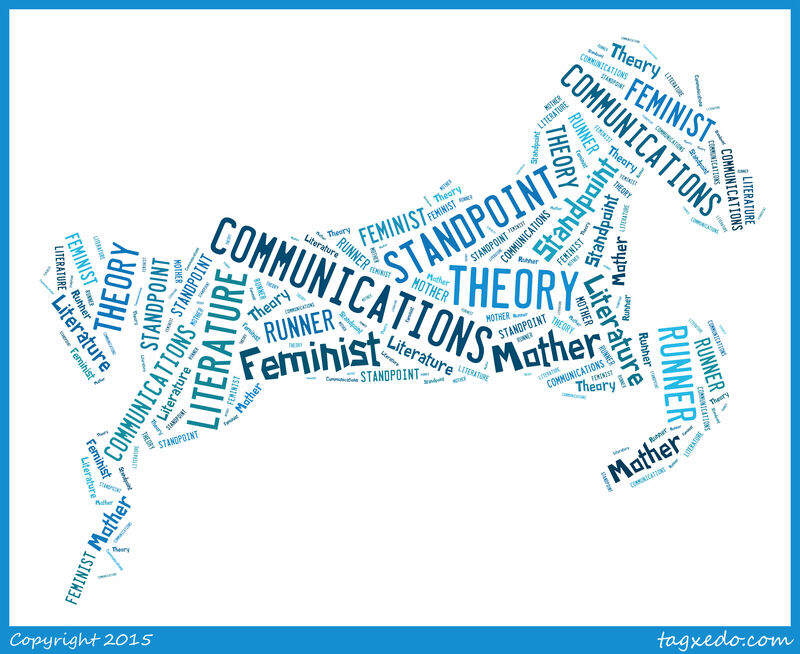 I used feminist standpoint theory in my final comprehensive communications project: One Mother Runner. I scoured over 60 resources for my initial project proposal and those sources included research from scholars on feminist standpoint theory, body image, motherhood in magazines and running communities. Through the research from other scholars, I was able to view the research through the lens of feminist standpoint theory. For example, the research on feminist standpoint theory, aims to promote understanding that a “woman” is not just a body, but also is an unheard voice in a “man’s world” (Rakow and Nastasia, 2009, p. 267). The bottom line is that this theory believes it’s a man’s world, in which men’s language is preferred. I was able to use this theory to understand how body image, representation of motherhood in magazines and the running community, tie into the viewpoint promoted through feminist standpoint theory. Scholars agree that boys and girls are taught from childhood how to feel about their bodies. From a young age girls derive their self-esteem from their body weight and shape, while boys pull from a variety of attributes. This contributes to women feeling as if they have to adhere to the ideal of beauty. Women are constantly subjected to unrealistic body images and expectations of how they should diet and exercise more than men. Movies, advertisements and other mainstream media portray the female body as a sexual being. This ties into the research scholars asserted about the portrayal of women in fitness magazines. Researchers found that the act of framing women differently in fitness magazines strips them of power in both the sport and society. Lynn, Hardin and Walsdorf (2004) say, “Advertising serves a primary role in the maintenance of hegemonic order; gender roles and consumerism are reinforced,” (p. 336). This is referred to as commodity feminism. Through this research, I had an “ah-ha” moment, which is the fact that women are portrayed as sexual beings in advertisements in fitness magazines to reinforce the unrealistic beauty ideals and suppress women’s self-esteem in an effort to promote products and encourage spending on products that promise to help women reach the “ideal” standard of beauty. This is directly tied to commodity feminism, as power, money and feminism are intertwined. As I move into the analyzing phase of my comprehensive communications project, components that I’ve been blind to in the past are coming to light. For example, when I read Runner’s World, I see the overt demonstration of males in the sport of running and the devaluing of women. I see the advertisements that portray women in a position as a sexual being. I’ve begun the coding and content analysis and I’m already seeing the results of content aimed towards women that falls within the weight loss, body image and beauty messaging. However, the messaging to men is in the categories of performance and gear. The advice and insight of Dr. McArthur, and all of my professors at Queens University of Charlotte, has helped me greatly in being able to view literature from the lens of theory and apply theory to content. I’ve created the website www.onemotherrunner.com as a result of the research for this comprehensive communications project. While I’m in the analyzing phase now and I’ve launched a pilot of the site…this is only the beginning. I am looking forward to the continuation of developing the onemotherrunner.com site and promoting content, images and inspirational stories with other mother runners to help them feel valued in the sport of running. I not only want to create an online community to fill the gaps in the literature for women runners, but I also want to draw attention to the issues pertaining to women in running and give them a voice. I seek to provide women with a voice in the running community and provide them with a forum to express issues pertaining to them and collaborate on solutions. I am evaluating other opportunities to engage the mother running community, including a fun run or 5K, partnerships with organizations that support women and running coaching for mother runners. This program ignited a spark in my passion for this topic and I’m excited to continue the learning opportunity and growth.